Fast Delivery: The note was written 4 July 1863. 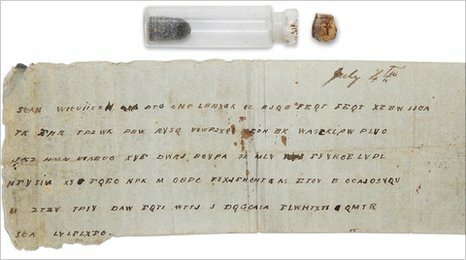 Cached in the tiny bottle shown above, the note was delivered the same day to General John Pemberton, commanding the Confederate troops holding the fortress of Vicksburg, Mississippi. The fortress, which effectively blocked traffic on the Mississippi, had withstood multiple attacks by General Grant’s forces, but its defenders were nearing starvation. Slow Delivery: In 1896, a former Confederate soldier gave the bottle, with its note inside, to the Museum of the Confederacy in Richmond, Virginia. We can thank General Sherman for tying down possible reinforcements. Vicksburg fell to the Union Army the same day that General Pemberton received the note: July 4. This was not just another battle: the fall of Vicksburg was a major morale boost for the Union, it opened the Mississippi River to Union traffic, which was crucial to the economies of the middle states, and it cut the Confederacy in two. It hardly seems possible that, despite the intense study devoted to the Civil War for nearly 150 years, we still continue to find new things about it.